I have supported Speedway since 1964 when the roar of Speedway bikes was first heard in Sunderland - I never missed a Match. The 'SAINTS' as they were known closed after only eight meetings - however - my education had begun. Sunderland re-emerged as the 'STARS' in 1971 opened by Allied Presentations (Len Silver). After a singularly unsuccessful first year we improved in 1972/3. In 1974 the Track changed hands twice - was again unsuccessful and closed early towards the end of the 1974 Season. I only missed one meeting in that time. I am now an avid Redcar 'BEARS' Supporter and Season Ticket Holder. Jim came to Sunderland in 1964 and he was obviously going to be a 'class' rider. It was his first year in England. An exciting rider to watch, he went on to ride for Wolverhampton and Sheffield. He also appeared in a World Final. He would be my Number one. Gordon came over from Australia with Jim Airey. He was very tall for a Speedway rider as I remember. It was his first year in England also. Another exciting Rider to watch and a real fighter. Gordon was sadly killed in a Track accident in Sydney, Australia. 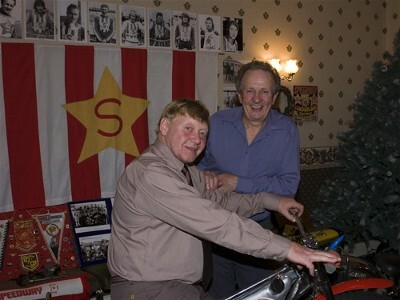 Russ came to Sunderland from the old rivals Newcastle Diamonds in 1971. He was captain of the team for most of the time Sunderland were open in the 1970's. Russ scored more points, more maximums than any other Sunderland rider during the four years of operation. Russ had a very keen sense of humour and once when a Sunderland rider lost a part of his thumb - Russ brought a matchbox over saying "here is the thumb" and when they looked - it moved. Russ had put his own thumb through the bottom of the matchbox. Of such things are Legends made. George was another 'original' Sunderland Rider in the 1970's. He was a REAL team man. He scored more Bonus Points than any other Sunderland Rider. George also rode in the same team as his son Terry. They scooped the Northern Pairs Championship at Sunderland. Bet that hasn't happened very often.......... Sunderland can actually boast another Father and Son riding in the same Team: Ken and Paul Sharples (1964). Graeme (the White Knight) only had one year at Sunderland but what a good rider he was. Always immaculately turned out he soon became a firm favourite of the Sunderland fans. His white line riding was first class and he scored lots of points for the Stars. Where to start?? Jack was probably the most EXCITING rider I have ever watched. In my opinion Jack was NOT a dirty Rider (as some Frank Auffret fans would have you believe) but he WAS a very HARD Rider. I can remember him riding with a broken leg - boot over the plaster, broken collar bone within two weeks of it happening. Jack was a real character - he was always ready to chat to Fans after the Meeting - never before. They say that Ron Wilson (Teeside promoter) always invited Jack to his Open Meetings as he thought it would add five hundred to the gate. There was of course also the spice of another round in the Frank Auffret - Jack Millen battles. Sadly Jack died in a car crash in 1978. Brian started off in the second halves at Sunderland. He progressed from reserve to Heat Leader whilst at Sunderland. He became a very reliable point scorer and was one of only three Sunderland Riders to score three hundred points or more. We see Brian regularly now at Redcar where he is the team manager. A little known fact is that Brian's son Gary used to ride a small bike around Sunderland when he was only eight or nine (possibly younger). A good quiz question - How many World Champions rode at the Boldon Track - Answer: Three - Ivan Mauger (Newcastle); Peter Collins (Rochdale) and finally Gary Havelock as a small boy.